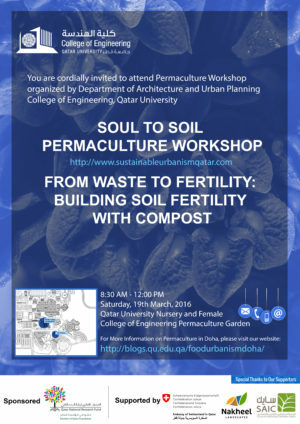 Permaculture Workshop poster. © Qatar University. 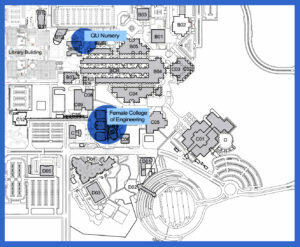 Map of the Qatar University campus, showing the University Female College of Engineering and the plant nursery. © Qatar University. SAIC continues to support the College of Engineering, Qatar University, in its work with students creating sustainable landscapes that contribute to food security and biodiversity on the Qatar University campus, and to collaborate with the Department of Architecture and Urban Planning, Qatar University (DAUP) to support events and projects on sustainable landscape projects at the University. (SAIC website).